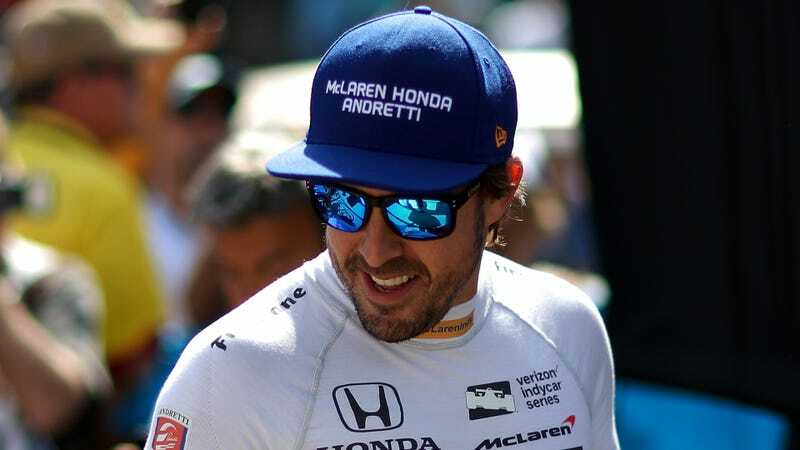 Two-time Formula One champion Fernando Alonso didn’t miss racing in the F1 Monaco Grand Prix he skipped for the Indianapolis 500, and it doesn’t sound like people from his home country did either. The reported Spanish television audience for the Indy 500 was more than double that of Monaco on Sunday. Since the races happen on the same day, Alonso missed Monaco to race the Indy 500. It was his first time racing an Indy car, and he was a contender for the win well until his poor, sad Honda engine led him to the fate he’s all too familiar with in F1: The car breaking on lap 179 of 200. He finished 24th as a result. According to the F1 Broadcasting blog—as cited by Sports Business Daily’s Adam Stern, who keeps a Twitter thread of the Verizon IndyCar Series’ television ratings each race—an average of 443,000 people in Spain watched the live broadcast of the Indy 500. There weren’t numbers from the year before, but the U.S. numbers for Indy 500 viewership actually went down. Compared to that, an average of 212,000 viewers in Spain watched the Monaco Grand Prix in which the retired-but-not-actually-retried Jenson Button subbed the race for Alonso. That means even though the races were at different times, the Indy 500, a traditionally American event, drew more interest in Spain this year than did F1’s biggest race. The Spanish viewership of the Monaco race was also significantly down from 2016, during which F1 Broadcasting reports that 302,000 people in Spain watched the event. Viewership dropped by nearly a third this year, which is a huge portion of the rather small viewership. Like any college psychology professor will tell you, correlation does not mean causation. We can’t prove that Alonso’s presence in the Indy 500 shot its Spain ratings to more than double that of F1, but we can make a pretty educated guess based on the factors surrounding the races. Mainly, the times each race came on in Spain don’t seem like they’d have much of an impact on viewership. The IndyCar race started at noon ET, which is 4 p.m. or 5 p.m. in Spain depending on the time zone you’re in. F1 started at 8 a.m. ET, which would be noon or 1 p.m. in a Spanish time zone. On a Sunday, those are pretty normal times of the day to have an opening in your schedule. But as an American, I obviously don’t know what Spaniards may be doing at noon that could tank F1 viewership. Whatever it is, they obviously weren’t doing it last year.